A paper published today in Geophysical Research Letters finds no significant change in Antarctic snowmelt over the entire 31 year period of satellite observations 1979-2010. 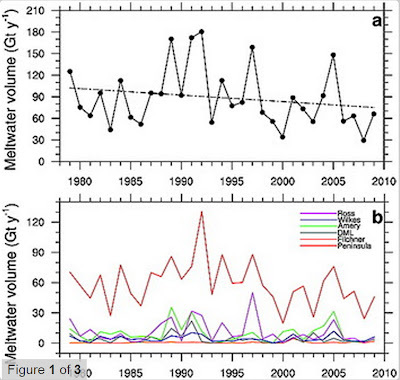 The paper actually shows a declining trend in snowmelt over the past 31 years, although not statistically significant. Of note, the abstract states, "other than atmospheric processes likely determine long-term ice shelf stability." Translation: increased CO2 and other 'greenhouse gases' do not threaten stability of the Antarctic ice shelf. 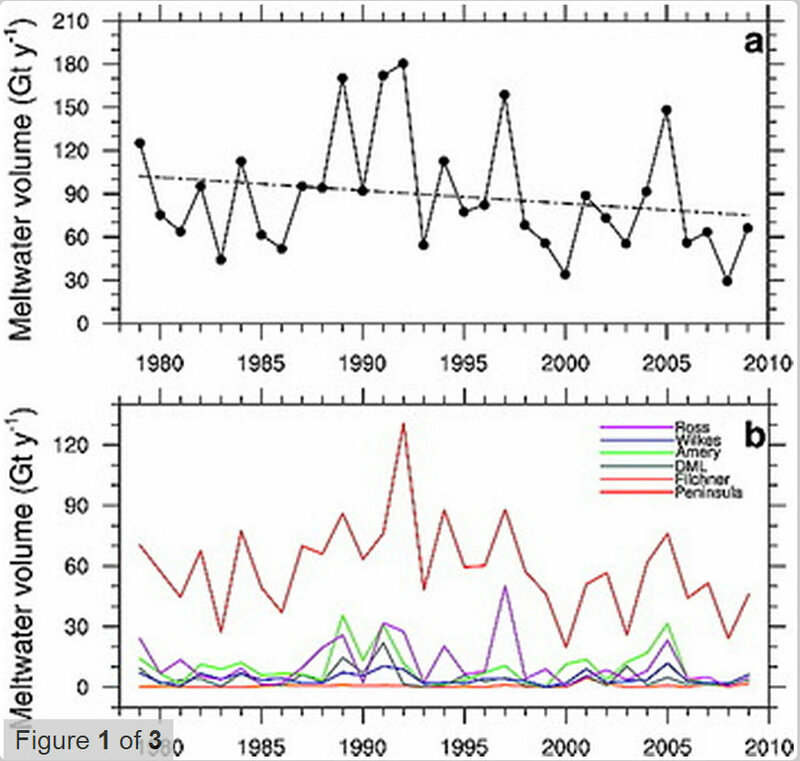 Meltwater volume for the Antarctic continent (top graph) shows a declining (statistically insignificant) trend since satellite observations began in 1979. Surface snowmelt is widespread in coastal Antarctica. Satellite-based microwave sensors have been observing melt area and duration for over three decades. However, these observations do not reveal the total volume of meltwater produced on the ice sheet. Here we present an Antarctic melt volume climatology for the period 1979–2010, obtained using a regional climate model equipped with realistic snow physics. We find that mean continent-wide meltwater volume (1979–2010) amounts to 89 Gt y−1 with large interannual variability (σ = 41 Gt y−1). Of this amount, 57 Gt y−1 (64%) is produced on the floating ice shelves extending from the grounded ice sheet, and 71 Gt y−1 in West-Antarctica, including the Antarctic Peninsula. We find no statistically significant trend in either continent-wide or regional meltwater volume for the 31-year period 1979–2010. Oil production is surging in the U.S.